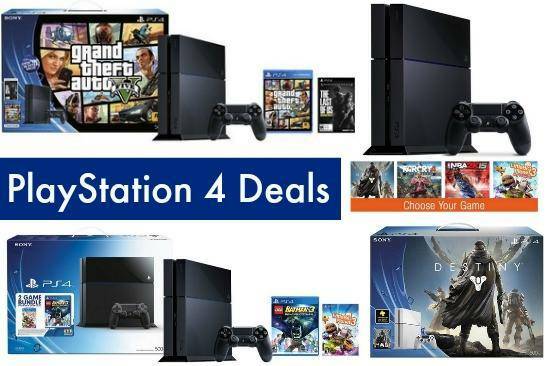 Home / Deals / Online Deals / Amazon Deals / Last Minute PlayStation 4 In Stock Deals on Bundles and Consoles! OK! I am looking around for everything I can that you wonderful readers are asking for and I was just asked about PlayStation Deals and I made you all a list of the Last Minute PlayStation 4 In Stock Deals on Bundles and Consoles! Walmart has this PlayStation 4 Bundle for $399.99 AND you will get to choose from one of four games! You can also get Free Shipping or Free Store Pick Up! You will get a FREE PlayStation Network $20 Code with the purchase of this PlayStation 4 Bundle w/ LEGO Batman 3: Beyond Gotham & Little Big Planet 3! It is out of stock online, but you can check your local store and see if it is available to pick up! It is in stock at a few of my local Targets! This PlayStation 4 deal also includes a FREE PlayStation Network $20 Code with the purchase of this PlayStation 4 Bundle! Also, this is only available for store pick up. You can get the PlayStation 4 Destiny Bundle or $399.99 and Best Buy also offers Free 2 Day shipping on this bundle! Great deal! Best Buy also has the bundle that includes Grand Theft Auto V and The Last of Us Remastered for $399.99 with Free Shipping! Amazon has a GREAT deal on the PlayStation 4 Bundle with your choice of game and they have Free 1 Day Shipping which is fantastic to get it in time for Christmas!